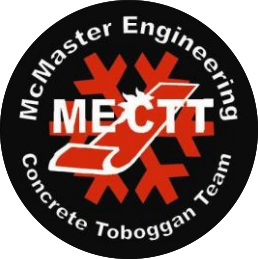 The Great Northern Concrete Toboggan Race (GNCTR) takes place annually and is held in different locations every year all across Canada. The GNCTR is Canada’s largest undergraduate engineering competition with approximately 20-30 students attending from most Canadian universities. Each competing team must create a toboggan which weighs less than 300 lbs, and can hold 5 riders. All surfaces in contact with the snow must be constructed out of concrete, while the frame and breaking system may be made from various other materials. The competition takes place over a 5 day period, during which there are many events set up by the organizing committee. Events throughout the week include an opening ceremonial dinner, a public exhibition where the toboggans are displayed and the technical aspects of the toboggan are evaluated. Lastly, there is a day exclusively set for the racing of the toboggans. Finally, there is a closing ceremony and formal dinner. The 2016-2017 team at Race Day, in Winnipeg, Manitoba. Find out more about GNCTR 2018 here .